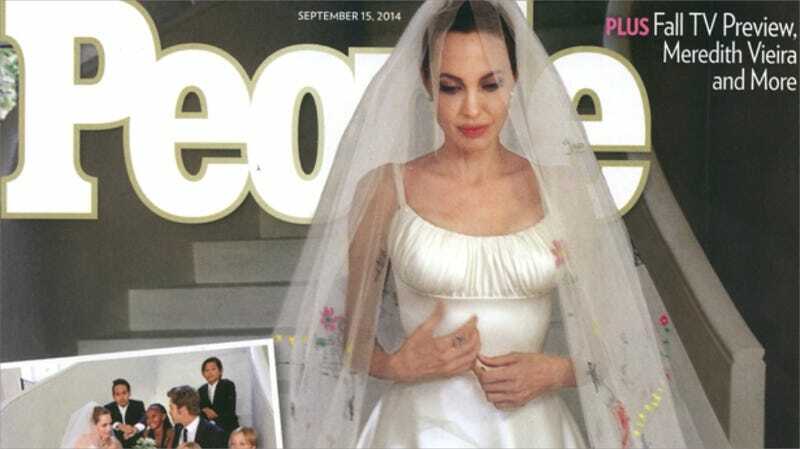 The photos and spread Brad Pitt and Angelina Jolie reportedly got $2 million for about their wedding are now here in full. While details of the accompanying article leaked before the piece arrived, there are a few choice details that we've missed. First off, Brad and "Angie" are described as "the planet's most-talked-about couple" (um, has People heard of Kimye ?). Other news: Jolie's wedding dress was designed to be a "quintessential wedding dress alá Princess Fiona in Shrek" and she served her "beverage of choice," which is apparently Bosnian rose petal juice. Still on the food front, the couple and their guests ate an "adorably askew cake" which was "baked and generously frosted" by their son Pax. As previously established, there was no music at the wedding; instead, family and friends hummed "Here Comes The Bride." The photos, which appear to have been taken by Getty photographer David James (who has shot for movies as well), were also in Hello.